Internet's Best Secrets: What's the thing about Portugal? What's the thing about Portugal? Every now and then you know I like to talk about my country - Portugal - and there's no better day to do it than today (Jun 10th) - our national day. 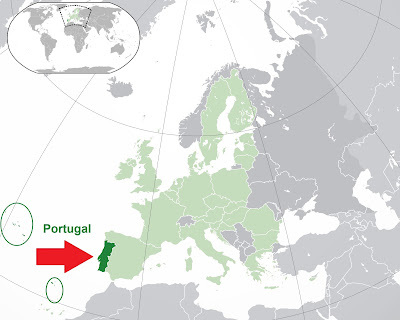 Well, let's se... Portugal is a smallish country in southwestern Europe. We're actually on the southwestern tip of it, making for the "face" in the Iberian Peninsula (and no, we're not in Africa, nor are we a part of Spain). We've been around for quite a while now... with our foundation going as far back as 868 (yes, that's a year). So, you can also imagine quite a lot as been going on over the years/centuries. If you focus on our golden years, we were a country of explorers that crossed the world in a time where few others dared to. Ferdinand Magellan, Vasco da Gama, are just a few examples of our great explorers, and even Christopher Columbus was reportedly Portuguese - though mainstream scholars still deny it (though they fail to explain why he named "Cuba" as Cuba... which is a name of a small region in Portugal where he reportedly is actually from).